حجم پیش‌نمایش PNG این SVG file:۸۰۰ × ۵۶۵ پیکسل کیفیت‌های دیگر: ۳۲۰ × ۲۲۶ پیکسل | ۶۴۰ × ۴۵۲ پیکسل | ۱٬۰۲۴ × ۷۲۳ پیکسل | ۱٬۲۸۰ × ۹۰۴ پیکسل | ۱٬۴۱۶ × ۱٬۰۰۰ پیکسل. ‏۳ ژوئن ۲۰۱۰، ساعت ۰۶:۵۷ ۱٬۴۱۶ در ۱٬۰۰۰ (۱ کیلوبایت) Zscout370 The Government emailed me back and said Pantone 2768 is used on the state flag officially. ‏۳ ژوئن ۲۰۱۰، ساعت ۰۶:۵۲ ۱٬۴۱۶ در ۱٬۰۰۰ (۱ کیلوبایت) Zscout370 Received Sec. 44.09.020 via email today. Complete overhaul. The yellow is Spanish yellow pms 1235 according to the state, but the blue is kept the same. ‏۱۴ مهٔ ۲۰۱۰، ساعت ۰۸:۳۱ ۸۵۶ در ۶۰۰ (۲ کیلوبایت) Zscout370 Sec. 44.09.020. 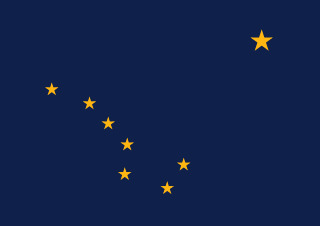 State flag states that the blue in the Alaska flag is the same as the US flag, so in this case, Pantone 281 C. I am not certain about the yellow color because the "proper form" is not shown at http://www.legis.state.ak.us/basis/folioproxy.